People still believe that Jesus is returning to earth ...and soon! Like Jesus' the first followers, millions of Christians hold fast to the idea that we are living in the last days, yet here we are, two thousand years later, still waiting. In The Homebrewed Christianity Guide to the End Times Jeffrey C. Pugh recounts his own brief sojourn in an apocalyptic cult. Looking back now, as a respected professor of theology, he tackles how Christianity in general, and the evangelical world in particular, have been captivated by the theological innovation known as Dispensationalism that emerged in the nineteenth century. The embrace of this idea has influenced millions, leading to such cultural phenomena as the Left Behind books and movies, and Christian Zionism. But Pugh argues that the belief in the imminent return of Christ has in fact been harmful to Christian engagement with the world, and he builds this argument on a thorough and occasionally sassy reading of biblical texts and church history. 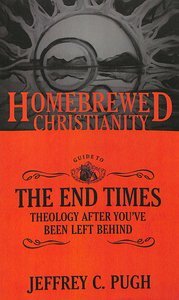 About "Guide to the End Times, the - Theology After You've Been Left Behind (Homebrewed Christianity Series)"